← Open letter to Otis Elevator Company. Beelines commenting: it’s not only about minutiae. 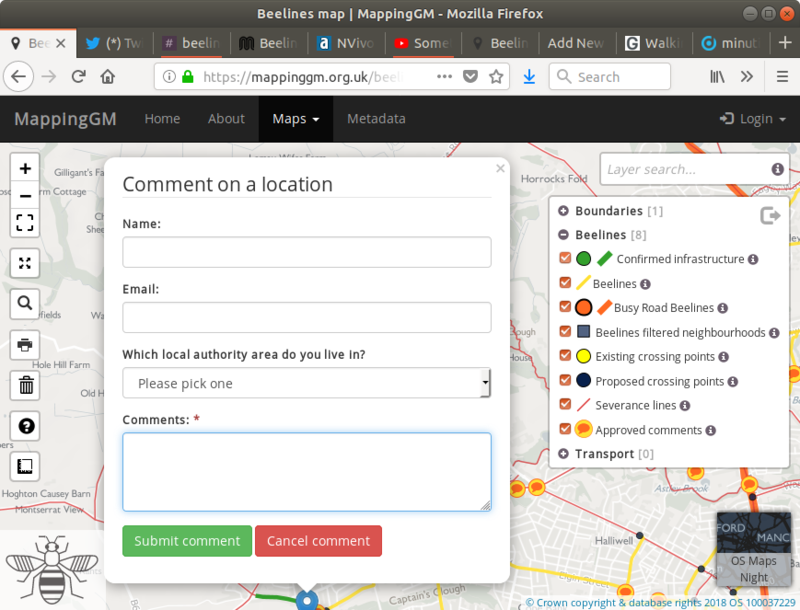 After a recent workshop about the Beelines consultation, I have to admit that I came away rather depressed by the amount of negativity that seemed to exist about the consultation. 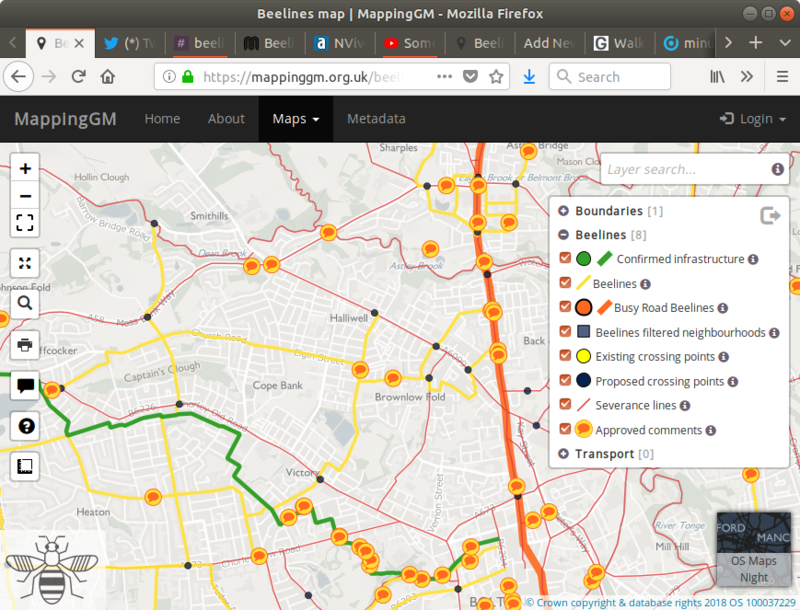 Beelines is a proposal for a walking and cycling network covering the whole of Greater Manchester. It is one key part of Chris Boardman’s 15 step strategy, entitled ‘Made-to-Move’ (PDF), to develop active travel (walking and cycling) across the whole of the region. 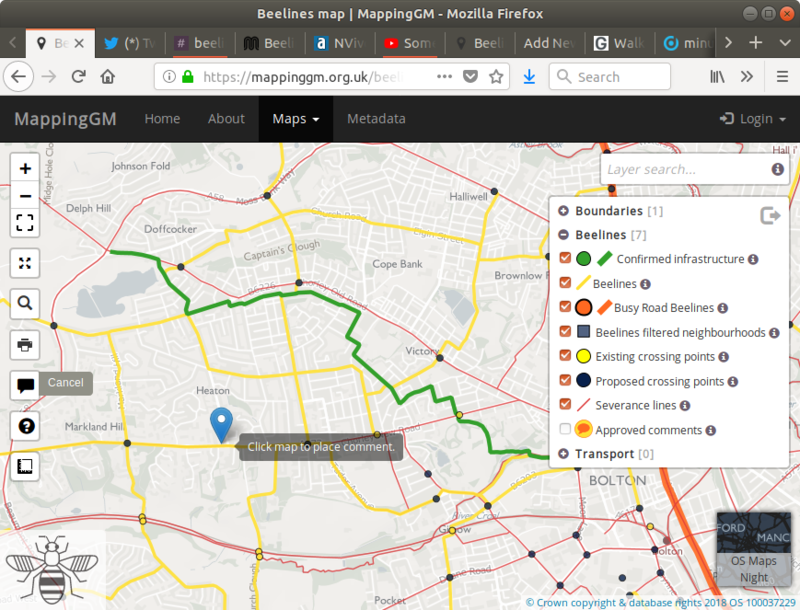 The current status of Beelines, the first draft, is a very rough, incomplete outline network plan that was created in a series of 2 to 3 hour workshops, one in each of the 10 boroughs, each one involving between 6 and about 16 people primarily from the Local Authority, campaign groups and residents. I wrote an article earlier about the Bolton workshop, and a friend who is much better at writing these things than I am, wrote about the Bury workshop, the Rochdale workshop and the Salford workshop. As such, it can only be a very rough first stab at a network which needs a lot of work to knock it into shape; the consultation phase, which is currently ongoing and concludes at the end of September 2018, is (IMHO) when the real work is being done. It is worth repeating here that Beelines is about a proposed network. It is not the whole Made-to-Move strategy; that was published in the document in December (linked above). 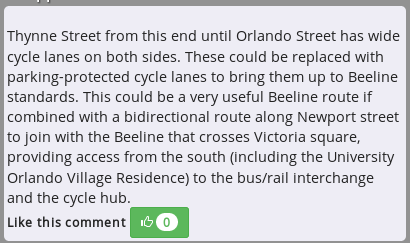 The consultation on Beelines is about that proposed network and nothing else. It is important to read the Beelines document (PDF) before commenting; despite its short length, it provides a lot of information about the assumptions, philosophy and approach being used and is extremely helpful when framing comments for feedback. It is also worth reading the Made-to-Move report, which I linked above, as that will make clear what the scope of Beelines is within the overall strategy. Comments will appear as icons on the map once they have been moderated (to remove abusive comments and spam), and can be viewed by clicking on the relevant icon in the map. These points, of course, are important and should be made, but they are not the only things that are needed. The point is that Chris Boardman’s team are asking us to help them design the proposed network. It is acknowledged that the first draft shown on the current map is just that; a first stab put together by a small group of people with felt tip pens in a 3 (or in some cases 2) hour workshop. They need us to own this rather than just complain that the draft isn’t perfect. cross referencing comments so that the overall picture is easier to see. I know I’m not the only one making comments like these, and I’m probably not the best at it, but if we want a decent walking and cycling network, then we need a decent network plan, and to get that we need to put a little bit of effort into helping the team to create it. This entry was posted in Article, Beelines, Space for Cycling. Bookmark the permalink. 8 Responses to Beelines commenting: it’s not only about minutiae. I was at that workshop and I feel that there were many there like myself who wanted a better sense of the overall picture, including the politics of thr situation in the various authorities. Unfortunately this rather derailed the plans for the evening, incliding your excellent presentation, which we were grateful for. Thanks for organising it, and I hope there will be more, focussing on both the details and the bigger picture. Thanks. I do think it was worthwhile anyway, although we already had a workshop on those wider issues in May. I feel there is a difficulty in dealing with the interface to LAs in that context because it really is quite different depending on which LA you are in. However, the political aspect will be something we need to come back to because there will be significant opposition to many of the plans. Yes, we (GMCC) are planning to have further workshops around Made-to-Move and Beelines. I’m one of those who has found myself disappointed by the juxtaposition of Boardman’s rhetoric on one side, which has been excellent as always, and the proposals so far which seemed disjointed to the point of chaotic. Quite the let-down. How were those 6 to 16 people selected? Even the marked “existing” routes are frankly misleading. Manchester (borough) contains nothing new to expand on existing proposals, and while we’re lucky to have Oxford Road – more than many boroughs have – it’s far from perfect and needs to be grown into the kind of network you refer to. One flagship route per borough isn’t a network – Greater Manchester is a big area! Also much of South Manchester has a demographic which considers utility cycling aspirational. You need to pick your battles with this stuff rather than imposing infrastructure on a more reticent area. So what’s Manchester’s share of the newly announced funding being spent on I’m interested to know? As for beelines only being one aspect of the new strategy, for me it’s the only important aspect. I just want a way to ride my bike across town safely (even when I’m with my kids). Everything else can come from that. I do appreciate the instructions on how to comment on the plans. I have already done so a little myself and will probably continue to, but it is difficult to know where to start. I can understand your frustration; I feel it myself having started cycling to work 30 years ago then giving up on it for many years until starting again almost a decade ago. However, I really think this is different. We are at the start of something that will take a long time to come to fruition. Getting engagement from the community is bound to seem chaotic at first, but in my view is better than having some experts who have no local knowledge imposing something from above. If the network seems disjointed, that’s because it isn’t a network yet; it’s up to us to make it into one. In fact, if you read the documents (Made-to-Move and Beelines; both linked in the article), it is far from chaotic. My understanding is that the people at the workshops were invited by the respective local authorities. In my case, I was invited because I have been a particularly vociferous member of Bolton Cycle Forum for years. If you want to know how yours was put together, you need to ask your LA. Manchester actually has the lion’s share of the first tranche of proposed funding, 9.5 million out of a total of 25.2 million. It is to add to the existing funding of 4.3 million for the Chorlton cycleway. It is of course easier to be ‘aspirational’ when your borough has received the lion’s share of the funding for years (Velocity 2025 and CCAG 1 & 2, for example). This is about all the 2.7 million people in Greater Manchester, not just the half a million people in the City of Manchester. One flagship project per borough is, again, a start. If they hold off from doing anything until they can do everything, then nothing will ever get done. What I said was: “It is one *key* part of Chris Boardman’s 15 step strategy”. I mentioned that point because the workshop I mentioned at the beginning of the blog article, which was intended to focus on Beelines and how we can help improve the initial draft of the network, tended to stray onto things that are really about other aspects of the Made-to-Move strategy. Those other things are important, of course, but it meant the discussion lost focus, which is quite frustrating. I see no-one saying that the network itself isn’t important, nor even that it isn’t the most important part. However, for every one of us that “just want a way to ride my bike across town safely (even when I’m with my kids)”, there are many others that just want to have every millimetre of road space dedicated to motor vehicles. This is the battle that needs to be fought, and there are many elements to fighting that battle in addition to putting lines on a map. Thanks for taking the time to comment, and I do hope you will continue to provide feedback on the plans and encourage others to do so. That’s the only way we’ll get want we want out of this. I’ve read the documents and as I say the rhetoric is all very positive and makes a lot of sense. 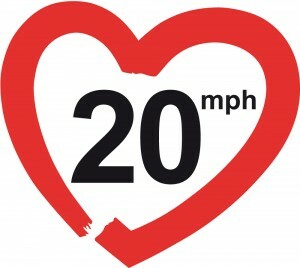 But again, without safe cycleways it’s just so many words. I’m surprised to hear that Manchester is getting the “lion’s share” (even in addition to the previously planned and funded Chorlton Cycleway), and my question would be what on earth are they proposing to spend it on?! 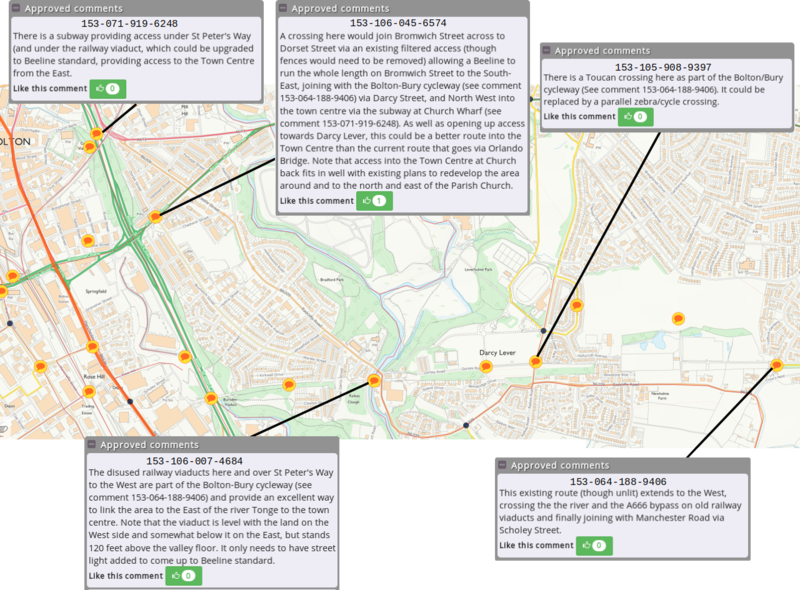 Because there doesn’t seem to be anything of note (in Manchester) on the map so far (except that Chorlton cycleway). My point about areas where cycling is aspirational hinges on the demographic, especially to start with. South Manchester already had a relatively high modal share long before the Oxford Road cycleway (not because of it), which is largely to do with the big student population, and areas of young professionals like Didsbury and Chorlton. I do of course take your point that conversely many areas need better infra to encourage bike use – you don’t choose to build a bridge based on where people are already swimming across the river etc – and all of GM should benefit from beelines but as you say there does need to be local buy-in to succeed. I’m certainly all for all the boroughs getting new facilities, I just don’t want to see developments paused in South Manchester. It would be great to see the existing (less than perfect) facilities begin to grow into a network, as similar (but better) facilities begin to be built elsewhere. I want both! I think we are mostly in agreement. I don’t see things being paused in manchester; quite the opposite really. I suspect the already secured funding for the Chorlton Cycleway way would be nowhere near enough to bring it up to Busy Road Beelines standard, and I have seen quite a bit of criticism of the existing plans, so perhaps it’s about raising the standard of that one. This is all going to take time, unfortunately. We should be able to move faster than the Netherlands did in getting to the situation they have now because a lot lessons have already been learned, but it has taken them over 40 years! It is frustrating, I agree. Indeed to all of that. I do very much appreciate your efforts to get people involved in the process and it’s spurred me on to get commenting on the map again, so thank you!